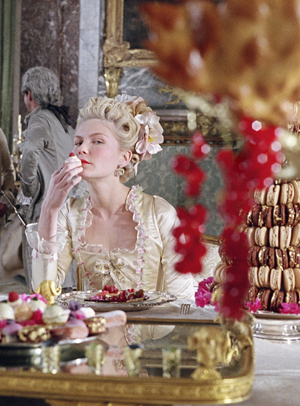 Let them eat ... macaroons! Let us pay homage to Catherine de Medicis for popularizing a few of my favorite inventions: high-heel shoes, the utensil that we call a "fork" and an almond-based cookie known as the "macaroon". Born into Italy's wealthiest merchant family, Catherine inherited the entirety of the Medicis' immense fortune at a young age. That made her the richest woman in the world and a perfect match for the Duc d'Orleans—future king of France (Henri II), whom she married in 1533. When she relocated from Italy to France to wed Henry, Catherine brought her pastry chef to the French court. Soon after Catherine de Medicis' pastry chef introduced the macaroon to France, the recipe was elaborated and improved. Originally just a humble combination of almond powder, egg whites and sugar, the macaroon evolved into a delicacy that spread to villages all over the country. We can credit Pierre Desfontaines, the grandson of Louis Ernest Ladurée—founder of the celebrated maison de pâtisserie and tea salon in Paris—with the creation of the double-decker macaroon. Desfontaines took two macaroons, filled them with buttercream, chocolate ganache or jam, and created exquisite cookie sandwiches. Today macaroons are fashionable cookies in Parisian pâtisserie shops. The macaroon has become synonymous with chic. On an episode of Gossip Girl, Blair indulges in macaroons from the Ladurée boutique in New York City. I love how she's wearing the most darling froufrou outfit, oh so perfect for the moment! Here in San Francisco, Chantal Guillon has taken the idea of the high-style macaroon to the next level—with impressive presentation and innovative flavors. Her boutiques are as enchanting as jewelry shops, filled with beautiful handcrafted creations made of the finest local organic ingredients. Chantal moved to California from France in 2008 and brought classic Parisian macaroons to the local SF foodie audience. She offers quality to rival the very best classic pâtisserie shops in France and has added a touch of modern flair with vibrant hues and artistic details. Chantal opened her first retail location in San Francisco on Hayes Street with a shop resembling a Paris atelier, then expanded throughout the West Coast. You're sure to be swept away by the colorful assortment resembling a painter's palette. Succumb to temptation and enjoy a selection. Dark Chocolate, Tahitian Vanilla and Persian Rose are obligatory. Also try the more novel macaroons: Orange Blossom-Strawberry, Jasmine Green Tea and a minty Mojito. You'll want to sample them all, and why not? You deserve the royal treatment! Chantal Guillon is amazing! What a great idea for a mother/daughter outing! Your mom will love it!! I love macaroons more than chocolate itself! But this blog makes them look even more beautiful than usual, and the history is something of which I was never aware. Thank you for posting all this. I cannot wait to visit and taste and browse and taste and purchase and taste. Thank you for your comment! Hope that you enjoy your visit! Have fun sampling all of the different macaroons!